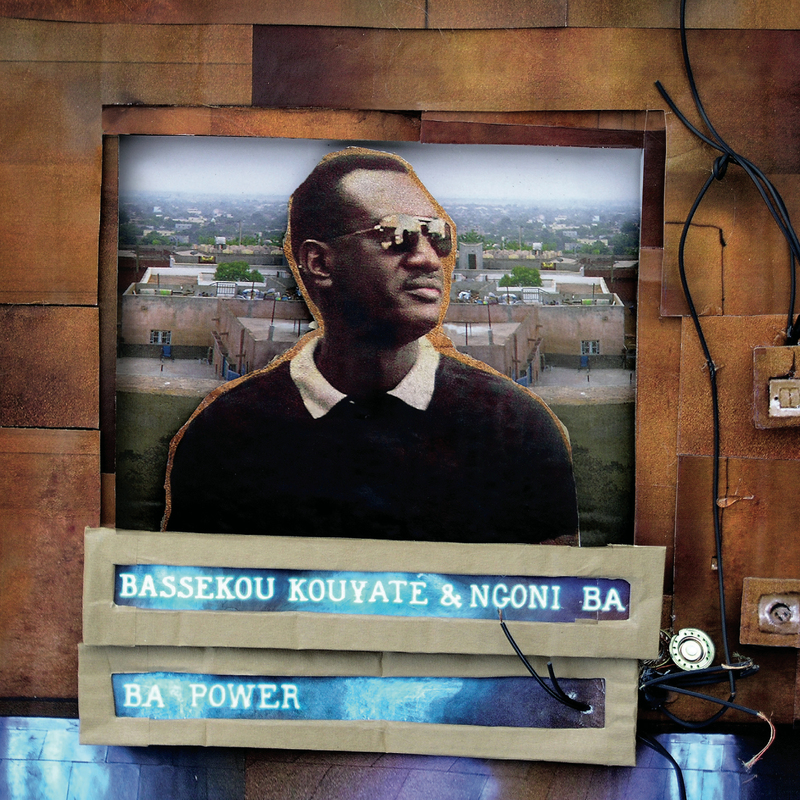 Bassekou Kouyaté & Ngoni Ba ‘Ba Power’ (Glitterbeat) 27th April 2015. 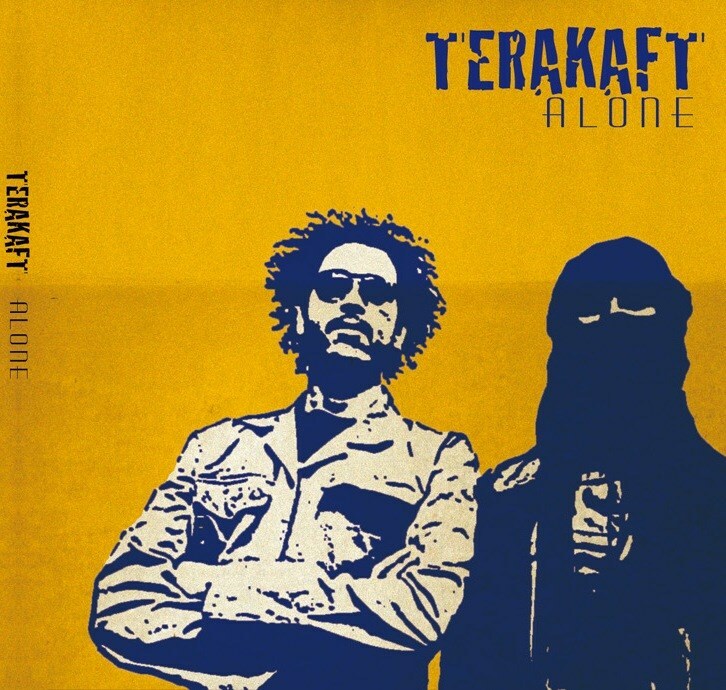 Terakaft ‘Alone’ (Outhere Records) 11th May 2015. It’s difficult, nee impossible, to review and feature the music emanating from Mali without briefly outlining the country’s past and current difficulties. Such is the devastation and injury caused during years of civil war which began with a rebellion in the north by the Tuareg – for various reasons unhappy at their treatment and alienation from the Malian central government; fighting for an autonomous region, named the Azawad, in the north east -, though the instability caused by the spread of an ever more aggressive hardline form of Islam from outside the country and natural concerns such as drought have conspired to pull Mali apart. Whilst the Syrian conflict – for good reason – continues to dominate the news feeds internationally, the countless infractions and acts of brutality in North and West Africa struggle to make the headlines. Whether vaporised by western technology or bullying the local populations across the region, ISL, ISIS or whatever the abbreviation is these days, the victims in this bloody battle to establish a tyrannical caliphate are for the most part Muslim. With a zealous taste for punishment and a puritanical mindset that would put Cromwell’s prudish stoicism to shame, they’ve all but condemned any practice, activity and spark of creativity that falls outside their myopic perimeters. And if, like many tribes that make up the fabric of Mali your customs and atavistic roots heavily feature song and music than you’re for the CHOP! After years of civil war between the government and the Bedouin Tuareg people an uneasy but stable truce has returned some kind of normality back to the country. 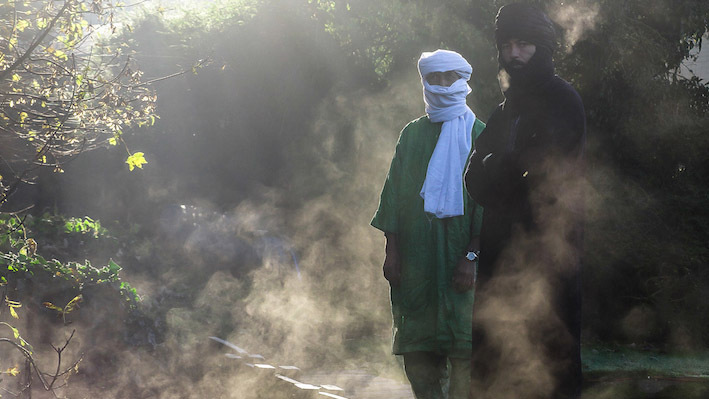 A “rebellion” that was dominated both by hardliner Tuareg groups such as Ansar Dine and insurgents from outside the country, the recent embittered conflict threatened to escalate as fanatical Islamist elements dominated. Invited or not, they saw an opportunity to conquer and spread their Sharia dictate, much to their ill-at-ease comrades in the more moderate National Movement for the Liberation of Azawad. Far too complicated and nuanced than the space given here for a music review, the eventual outcome was a three-way battle between all parties as the Tuareg fell out with each other. With the capital of Bamako at risk – though the fountain of Mali knowledge and much-venerated ancient seat of learning, Timbuktu was captured by the Tuareg groups and made the state capital of the Azawad region, before being recaptured by government forces – the Malian government were forced to work with their former colonial rulers France to take back control. It’s hardly a surprise to find countless poignant allusions to these events throughout the Malian music scene, from the Tuareg desert bluesman to the capital’s hallowed-out canoe-shaped ngoni players. Despite this or perhaps because of it, Mali’s adroit musicians have provided some of the most richly rewarding, inventive and evocative music of the past few years. The triumvirate desert caravan of Tamikrest, Tinariwen and Terakaft and leading Malian greats like Samba Touré and Bassekou Kouyaté have taken back the blues and rock’n’roll from the USA and once again imbued it with the ancestral roots of West Africa to inject a much-needed new electrifying jolt of power into a limp genre: in the case of Bassekou, Ba Power. Following in the wake of Songhai bluesman Samba Touré’s nimbly picked Gandadiko LP earlier in the year, comes two more entrancing Mali peregrinations from Terakaft and Bassekou Kouyaté & Ngoni Ba. The first of these groups sighs for the simpler times, before the conflict, and emphasis an isolated resignation of loneliness; the other adopts an outward approach to both themes and musical inspiration. Terakaft, a moiety of the desert blues and rock progenitors Tinariwen, sing of hope eroded, their political and social aspirations torn apart by both internal and external strife. Yet despite the Alone title, the music on this album edges ever closer to the dance floor with a kick and locked-in Saharan strut. Swaying effortlessly with a groove so cool it would shake the Wailers (before the cod-reggae years took hold) from their languid candour, the Terakaft jerk doesn’t dwell on the hardships and blues for long, instead it glides along in a progressive, hypnotic and funky manner throughout its transient rise from the drinking-tea-amongst-the-sand-dunes landscape to the world’s airwaves. Fronted by the dual dynamism of, old-hand, desert rhythm acolyte Diara and the younger “Saharan cowboy, with Wah Wah Watson sideboards and full Rock and Roll attitude” Sanou, the group shake, rattle and roll through a shimmering mirage of Gnawa trance and camel-trail rhythms to create their best album to date. Partly recorded at Peter Gabriel’s renowned Real World Studios in Wiltshire by the British musician/producer of repute Justin Adams (Robert Plant, Tinariwen and Juldeh Camera), there is a relaxed buoyancy to many of the songs: an enticing, melodious shuffle that proves enticing. Though the venerated atmosphere – sometimes in hushed hums, as on the heartbeat pulsed strut ‘Tafouk Télé’ (The Sun Is There) – of religion and the turmoil of conflict can’t be missed, most of the music shifts like the desert sand in a light breeze. Alone is a soulful, deeply spirited but mesmerizingly solid rock and roll album, the group on another level entirely locked into a groove of kinship. This isn’t just a recommended purchase; it’s an essential one. Elevating the atavistic griot storytelling tradition of Africa, backed by an interlocking quartet of quick, articulate and blazing ngoni players, renowned Malian musician Bassekou Kouyaté follows up his critically acclaimed last LP Jama Ko with something a little bit different. That previous record led to a two-year global tour, which gave the tightknit family band amble time to lock-in their incredibly intense Afro-rock and blues sound. Though the reverberations of the past centuries still resonate – especially through the beautifully primal cry and evocative vocals of Bassekou’s wife Amy Sacko and the lute-like instrument magic of the ngoni – this is a very modern album; amped up and warped with a full-on wah wah pedal frenzy. Billed as his most “outward looking” album yet, with the musical inspiration net cast wider to include rock and roll, jazz and Afrobeat, Ba Power is not exactly Bassekou electrified for the first time, but it does boost the earthy and striped plucked sound of old for something tougher and wilder. A number of the great and good of the Mali music scene join Bassekou on this latest venture, including both the Songhai blues guitar legend and label mate Samba Touré and veteran master of the horsehair, single-stringed Soku and singer Zoumana Tereta; the pair lend a nifty series of blues licks, grizzled wise vocals and vibrato eastern-mystical flavor to the choppy ‘Fama Magni’. Elsewhere, Afro-pop artist and mainstay of the, Mali capital, Bamako’s club circuit, Adama Yalomba sings soulful vocals on the drum’n’ngoni-dominated dance floor shuffler ‘Waati’ – a meditation on Time -, Robert Plant’s The Sensational Space Shifters’ and (another Glitterbeat signing; though arguably this whole LP is a label like family affair) Fofoulah drummer Dave Smith rattles off a nice Dirtmusic meets Afro-garage rock polyrhythmic backing on the opener ‘Siran Fen’ – which also features current Lemonheads member and one-time Thurston Moore Band guitarist Chris Brokaw marvellously channeling (and wrestling) both western psychedelia and Afro-rock on lead chops -, and “fourth world music” inventor and paragon of polygenesis fusion Jon Hassell playing expansive, sometimes low foggy horn, yearning trumpet lullaby’s and keyboards on ‘Ayé Sira Bla’. Bassekou is himself on fine form, blazing through and ripping apart the ngoni rulebook as he takes the instrument to new heights of sophistication and energetic exuberance with his trio of nuanced practitioners. Enriched by the Glitterbeat production method, handled like a true craftsman by label head honcho and musician Chris Eckman (who’s had a series of successes with the quality label of contemporary West African music, and helped steer Tamikrest and Aziza Brahim to a wider audience), this will be Bassekou’s most accessible and lively album yet. If Jama Ka was a cry from the centre of a conflict ravaged Mali, in the middle of a civil war, then Ba Power strives to appeal to more universal themes and to finally establish Bassekou and his group as major players on not just the “world music” but also the music world stage. Whilst we look inward at our own scene in Europe or look across the Atlantic to the States, it is becoming quite clear that the mostly seen as exotic African music scene is leading the way, with Mali standing out as a provider of the most imaginative, transcendental and hypnotic blues and rock and roll.